Once the blue vase was stitched in place, it was time to add the gold doodads. ( doodad: something unspecified whose name is either forgotten or unknown). But first I had to choose the gold fabric. I loved the pattern on this one, but it was just too light. And this one was too dark. I guess I would classify this as dark brown/gold. This one suited my fancy!! So I stitched on some doodads. Next came the vines and leaves…. 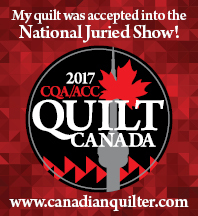 It is time to start hand-quilting again. I took a break through the holidays and Bruin was delighted! Lookin’ good! There you go again…getting lots done!! your work is stunningly beautiful. I love the choice of fabric for the doodads! I know I can always look forward to something amazing each and every time I read your blog entries….